Glossybox always takes forever and a day to get to me, so I was surprised and excited to wake up to my box this morning! December's theme is Glamour, Glitz, and Gloss and it promises lush products to get you ready for a holiday night on the town. 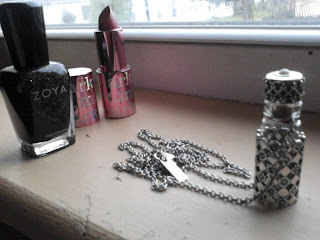 As an added bonus, they partnered with Jewelmint to add an extra gift to the box - a piece of jewelry. Yay! I received seven items this month! ForestEssentialsLuxuriousAyurveda - Madurai Jasmine & Magra bath & shower oil - This is a huge size! It's a moisturizing oil that can be added to the bath or rubbed into the skin afterwards. My dry winter skin appreciates this. It smells like jasmine, which isn't my usual thing, but it's nice. Will definitely be used! Heartland Fragrance Co. Bath Salts in White Ginger - These are healing aromatherapy bath salts. They can be added to the bath or used to exfoliate the skin! I have been dealing with sore muscles lately, and these will be awesome to add to my bath. They smell great! mark. Lipclick luxe lipstick in m.powerment petal - This lipstick has the cutest magnetic packaging...it's a pretty rose color, and the line was created to raise awareness for an important women's cause - domestic abuse and violence. Excited about this! Pleats Please by Issey Miyake - This is a brand new fragrance meant to embody joy and femininity. My sprayer is broken, but what I can get out smells nice, but isn't really my type of fragrance...definitely a sweet floraly scent. Wella - Velvet Amplifier - This is a tiny foil packet, but it is a bonus item and not one of the main five, so I don't mind! It is meant to prepare the hair for styling and improve manageability. This will get use, as my hair needs all the help it can get. Zoya - Ornate Collection polish in Storm - The ornate collection are meant to transform your nails into jewels! I received Storm - a sparkly black, and I love it! Of the collection, this is the shade I was most hoping for, so I'm excited about this. And as always, Zoya's formula is great. Jewelmint - Bonus jewelry item. They've sent out a wide variety of items...I've seen girls on MUT get rings, knuckle rings, bracelets, double bracelets, and necklaces. Of all of them, I got the one that I like the best! It's a long chain with a cute bottle pendant. I love pieces like this and can't wait to wear it! Here are my Zoya in Storm, mark lipclick, and Jewelmint necklace. So cute. 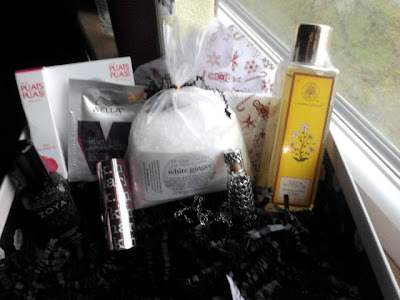 I think this was a great month for Glossybox! What was in your box this month?